Credit: Photo courtesy of Tony Studer, University of Illinois. URBANA, Ill. – With approximately 80 percent of our nation's water supply going towards agriculture, it's fair to say it takes a lot of water to grow crops. In a climate with less predictable rainfall patterns and more intense droughts, scientists at the University of Illinois are working to reduce water consumption by developing more efficient crops. "There's a study from many decades ago that shows the amount of water transpired and lost to the air in an acre of corn is 3 to 4 thousand gallons per day. At 90 million acres of corn in the U.S., plus the length of the growing season, that's lots and lots of water. So there are a lot of improvements that need to be made," says Tony Studer, assistant professor in the Department of Crop Sciences at U of I, and author of a new study in The Plant Journal. A previous study from Studer's group suggests corn could become 10 to 20 percent more efficient through breeding improvements, which would mean that plants would be less stressed during short-term droughts. Theoretically, this could add protection for farmers, given uncertain weather patterns. But to make that a reality, according to Studer, the breeding process itself needs to become more efficient. "It takes a lot of time, space, and effort to produce a productive hybrid," Studer says. "If you're going to study water use in a breeding environment or in a field at scale, you need something faster," Studer says. Once carbon dioxide enters plant leaves, the carbon is incorporated into sugars and plant tissues. Scientists can then measure how much 13C was incorporated compared to 12C. For many plants, the ratio of 12C-to-13C is indicative of their water-use efficiency. But until now, scientists didn't know if the ratio could reliably reflect water status in corn. Studer's study shows it can. "We found significant variation in the 12C-to-13C ratio across 36 diverse lines of corn, and the 12C-to-13C signature is heritable across environments," he says. "Proving that a trait is inherited and expressed across environments allows a plant breeder to select for this trait and is essential when developing new lines." The finding, derived from controlled greenhouse trials as well as three field seasons, provides the efficient method Studer was looking for. And it shows that inbred lines whose carbon ratios are within a certain range may have greater water-use efficiency, although it's too early to say how this will play out in hybrids. Right now, it's enough that the trait appears to be heritable – that alone will be a great help to breeders. But Studer has plans for next steps. "In a past study, we found there's room for improvement in corn's water-use efficiency. Here, we're showing that the trait is measurable and heritable, and we can actually use it to try to make improvements," he says. "The next step is identifying the genes in these regions of the genome that we can manipulate. We've moved all the way from a basic idea of developing the science behind these traits to the point where we can actually make improvements." 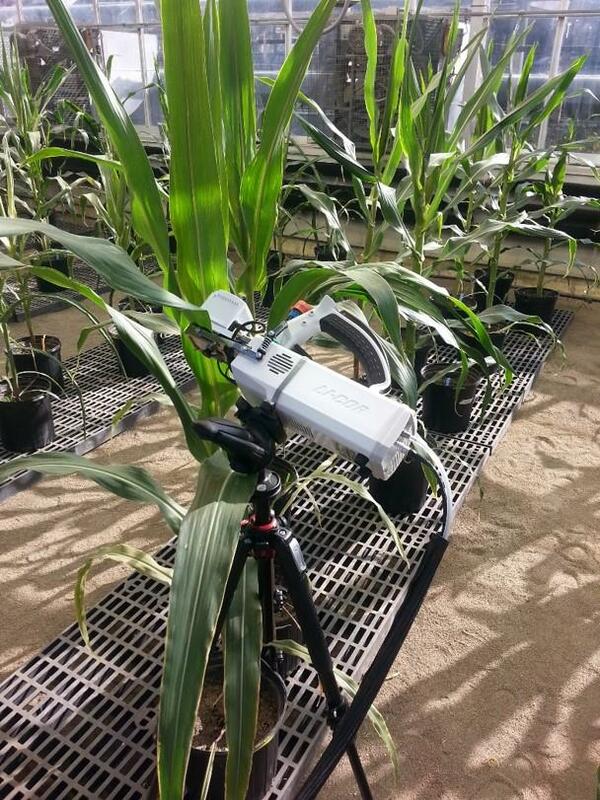 The article, "Leaf stable carbon isotope composition reflects transpiration efficiency in Zea mays," is published in The Plant Journal [DOI: 10.1111/tpj.14135]. Authors include Robert Twohey III, Lucas Roberts, and Anthony Studer. The work was supported by the USDA National Institute of Food and Agriculture.